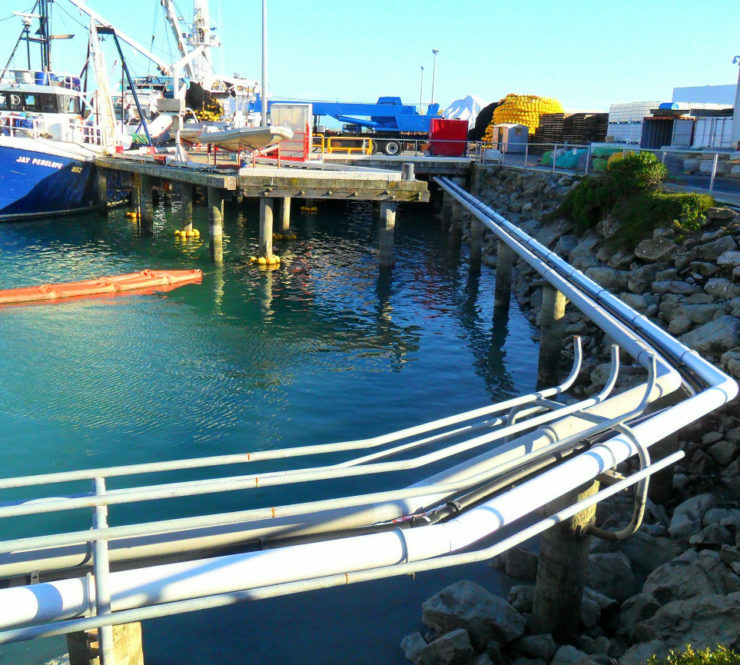 In March 2016 Brightwater extended the existing Diesel and Light Fuel Oil pipelines by 200m at Port Nelson to create a new ship refuelling berth. The pipelines had to be run on new piles and slung underneath and existing wharf to the new refuelling berth. Brightwater undertook the detailed piping design including thermal, wind, seismic and pressure analysis to ensure the new and modified piping confirmed with the requirements of the ASME B31.1 piping code. The piping was installed and welded following Brightwaters in weld procedures by our ASME certified piping welders, weld inspection was undertaken using Brightwaters in house CBIP accredited welding inspector. Brightwater fabricated all the stainless steel pipe support brackets and worked in with the pile designer and pile contractor. As the port was always in operation the scheduling of the installation was well planned to minimise disruption to operations as well as working in with the tide cycles as the pipelines were at the high tide mark.